« More Disney: Why is Mickey fingerprinting me? Let’s start with the basics …. For openers, fingerprint scans can record images – pictures of the fingerprint – or biometrics – mathematical representations of the fingerprint. 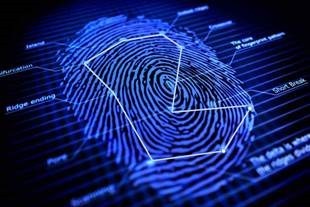 In the old days, law enforcers might try to visually match a crime scene fingerprint to a previously collected picture of a known criminal’s fingerprints. Obviously, a cumbersome, time-consuming, imprecise manual process. Digital scanning the pictures (“dumb images”) made the process a bit more efficient since analysts could “page down” images faster than turning hard copy pages. Still, a pretty crude operation. Enter the world of biometrics. You’ve probably seen scenes in CSI shows with an analyst looking at a display with a target fingerprint on the left … and a series of known fingerprints rotating on the right until the computer flashes that a match has been made. A major advance came when fingerprint experts began to “characterize” fingerprints – by identifying tell-tale points on a fingerprint (see the graphic above). Next step: mathematize the characterization. That is, transform the key characteristics of the fingerprint into a “wire frame” geometric form – the connecting lines above. Then, convert the geometric form into a mathematical code. Then, compare the mathematical codes of a target fingerprint with potential matches. If the codes match, the fingerprints probably (but not certainly) match. The company claims that no fingerprint images are ever stored … that fingerprints (which Disney calls “ticket tags”) are automatically converted to biometric codes … that the biometric codes can’t be reverse-engineered back to the “native” fingerprints … that all of the biometric codes are deleted after 30 days … and that the codes are held secure (i.e. not given to anybody) during the 30-day holding period. If a person tries to enter the park using another person’s gate pass (think: Magic Band), their fingerprint code won’t match the one on file … so, they’ll be stopped and asked for some identification … if they can’t produce conforming identification, the gate pass is confiscated and canceled in the system. If you buy that the system is strictly for protection from ticket fraud, this all makes sense… it’s not “magical”, it’s basic biometrics. Technical note: The same basic process is the essence of facial recognition systems: characterize a face, mathematically code the characterized image, match against other image codes. Disney takes a lot of pictures of park guests … many of which are linked to guests profiles through their Magic Bands. This entry was posted on January 29, 2018 at 6:59 am and is filed under Biometrics, Disney - Disney World, Security - National Intelligence. You can follow any responses to this entry through the RSS 2.0 feed. You can leave a response, or trackback from your own site.